Among the most controversial and misunderstood aspects of art therapy are interpretations of the art and its corollary, assessment. Art expression can be so seductive and the investigator’s wish “to know” so strong that one can readily project meaning into the art of another. Clinicians and colleagues, perhaps a bit mystified and awed by the world of art, may look to the art therapist as possessor of the Rosetta stone to decode the hieroglyphics of clients’ images. Such can be heady expectations an art therapist might year to fulfill. Beginning art therapists, still treading unfamiliar ground, may feel surer of foot shod with well-worded assessment procedures developed by senior art therapists. For example, many a time I have assigned students to practice conducting an assessment interview, encouraging them to develop a series of art tasks that would provide the information they are seeking, only to have them respond with, “I have decided to do the Ulman” (a much used series developed by Elinor Ulman). Questions of validity and reliability of the test are seldom raised. Although in the broadest sense of the word, assessment is a continuous part of the psychotherapist’s ongoing work in monitoring a clients’ progress, in its more specific usage assessment is a procedure for gathering information about the client. The information may include both history and present state. There are various purposes for conducting an art therapy assessment (Wadeson, 1989). The most common is an initial interview for treatment planning. This may include a determination of whether art therapy would be beneficial to the client. Under these circumstances, establishment of rapport would be an important ingredient in the assessment session. In treatment planning, information revealed in an art assessment may open doors to significant passages for work. For example, a psychiatrist and social worker working with a hospitalized depressed man and his wife felt stuck in their therapy with the couple because the husband was so withdrawn. In desperation, they requested an art therapy assessment session they observed through a two-way mirror. One of the pictures that I requested the couple each draw was an abstract of their marital relationship (Wadeson, 1980). The husband drew an enclosed form and said he felt trapped. After the session, the psychiatrist said he learned more about the couple than he had in ten verbal sessions. From observing only one art therapy assessment, the psychiatrist and social worker were able to continue verbal couple therapy, now no longer struck. When I worked at the National Institute of Mental Health where research projects required cohorts of a specific diagnosis, if researchers had doubts, they often looked to art therapy assessment for more specific information. Sometimes the art provided it. For example, although it appeared that the previous delusional state of a newly administered schizophrenic patient had cleared, the art therapy assessment revealed delusional ideation. In addition to diagnosis and current mental state, other specific information may be sought, for example, suicide risk or previous sexual abuse. Obviously these are important issues in treatment.Assessment may be used for research as well. 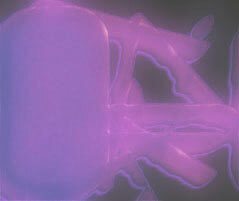 In such, the art may serve as a barometer, as in noting responses to medication, for example (Wadeson & Epstein, 1975). Or the art itself may be the subject of investigation as in noting the characteristics of art expression in depression (Wadeson, 1971). Although the examples above illustrate the fertile possibilities of information that art expression can provide, art images are like dreams in their illusiveness. There is no dictionary of meanings that can be applied to either. And there remains enormous confusion, both on the part of art therapists and those who work with them, as to just what can be gleaned from art therapy assessments. One can readily note artistic style, such as disorganization, empty, or intense? Content can be even more puzzling. Unless the client tells us, do we know that the house he has drawn is his childhood home, a symbol for himself, a stereotyped image he drew as a child? Is it possible to determine either suicide risk or sexual abuse from art? Sometimes. Can you count on it? No. Do some art therapists and their colleagues believe otherwise? Yes. Into this murky realm of uncertainty, misinformation, and confusion, Stephanie Brooke shines a beacon of clarity. She has selected a variety of frequently used art therapy assessment instruments for review. Her evaluations of them that she has completed in those book are significant contributions to the field in several different ways. Most immediately, they do provide “tools of the trade” with clear presentations of the information necessary for each test, including specifics such as authors, publishers, costs, time limits for administration and so forth. A thorough discussion follows covering test purpose, dimensions to be measured, administration, norm groups, score interpretation, validity and reliability measurements, and related research including utilization with various populations. 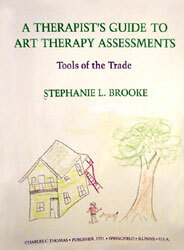 Unique in art therapy literature is Stephanie Brooke’s evaluation of each test for both desirable and undesirable features and an overall evaluation that shows clearly just what the test can and cannot do. In some instances, test authors have made claims that Stephanie Brooke has discovered to be unsound. The analysis of each test is both thorough and concise, well organized, and clearly presented. Armed with this information, the art therapist knows exactly what to expect from each procedure. The tests the author has chosen to review a broad range of assessment questions, including pathology, cognition, family dynamics, multicultural issues, self-perception, spiritual and relationship issues. After discussing each assessment procedure, she summarizes all their strengths and weaknesses. The book concludes with a recommendation to evaluate a client by utilizing a combination of assessments. A case study provides an example of how this may be done and their information that may be gained. In addition to supplying "tools of the trade," this book provides a significant picture of the state of the art in art therapy assessment. Stephanie Brooke shows us how far we have come and how far we need to go in designing art therapy assessment instruments.